Chris is the head of marketing at Tidelift. 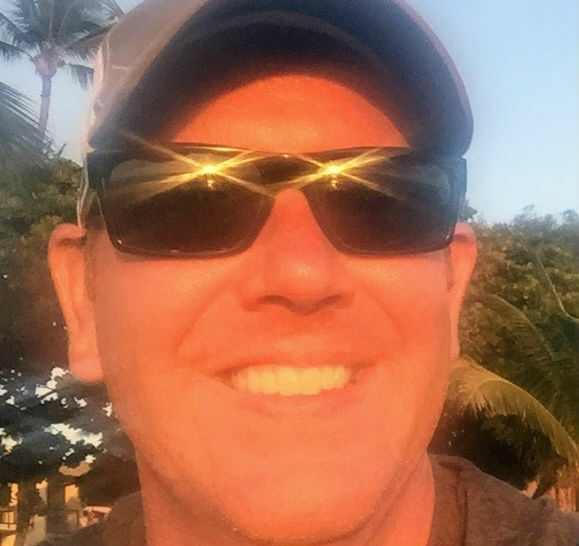 Chris has more than 20 years of experience building open source technology companies, including a decade each at Red Hat and technology-branding agency New Kind, where he helped build brands such as Ansible, NGINX and Anaconda. In addition, Chris is the author of The Ad-Free Brand: Secrets to Building Successful Brands in a Digital World. For application developers, open source has become an indispensable part of the development process. In fact, we’ve found that over 90 percent of professional developers use open source in building their applications. Why? 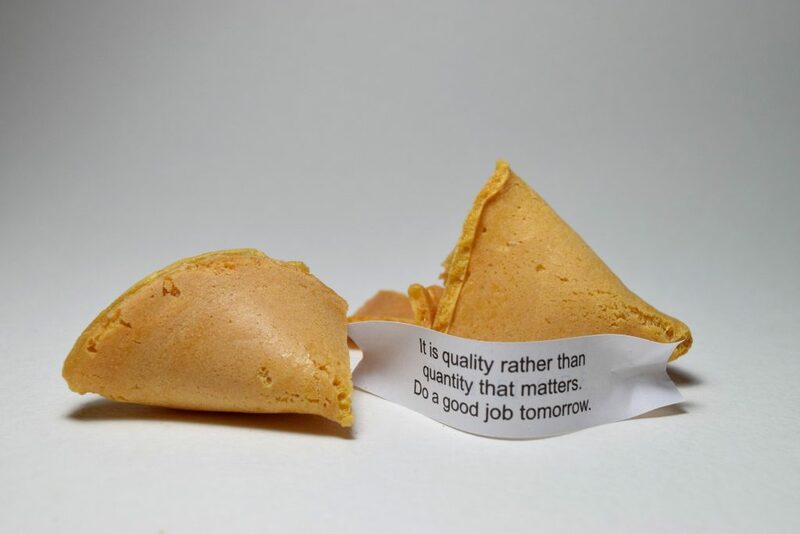 What do professional developers see as the biggest benefits of using open source? Conversely, what are the biggest drawbacks? And how much time do developers spend on maintenance tasks related to the open source packages they use? 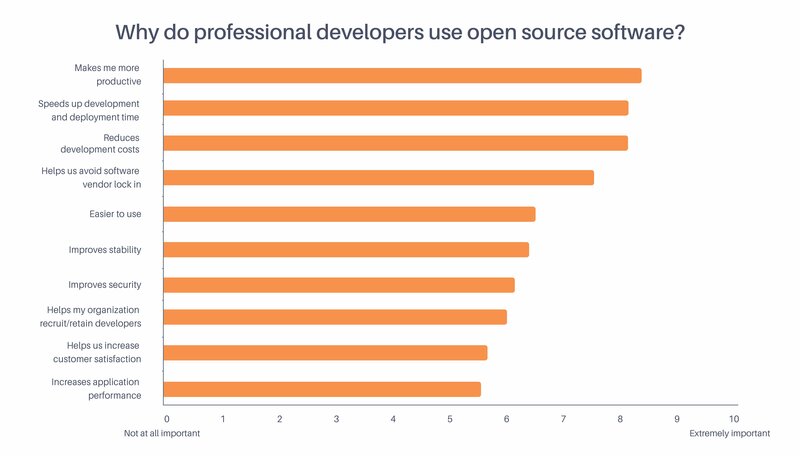 In a recent survey, nearly 300 professional developers helped us uncover some surprising new data about open source usage trends like these in professional development teams. Here are a few of the most interesting findings. Our survey listed ten reasons to use open source — from makes me more productive to increases application performance — and asked developers to rate them from not at all important (0), to extremely important (10). None of the ten reasons we listed scored below five — that is, none is seen as unimportant. Topping the list of open source benefits are makes me more productive, speeds up development and deployment time and reduces development costs. Tidelift makes open source work better —for everyone. Through the Tidelift Subscription and in direct partnership with maintainers, Tidelift is a single source for proactively managed open source components and professional assurances around those components. Staying current on packages they’re using. In addition, we found that respondents in organizations with development teams of 1,000 or more people are significantly more concerned with keeping track of the open source code in use than are respondents from smaller dev shops. 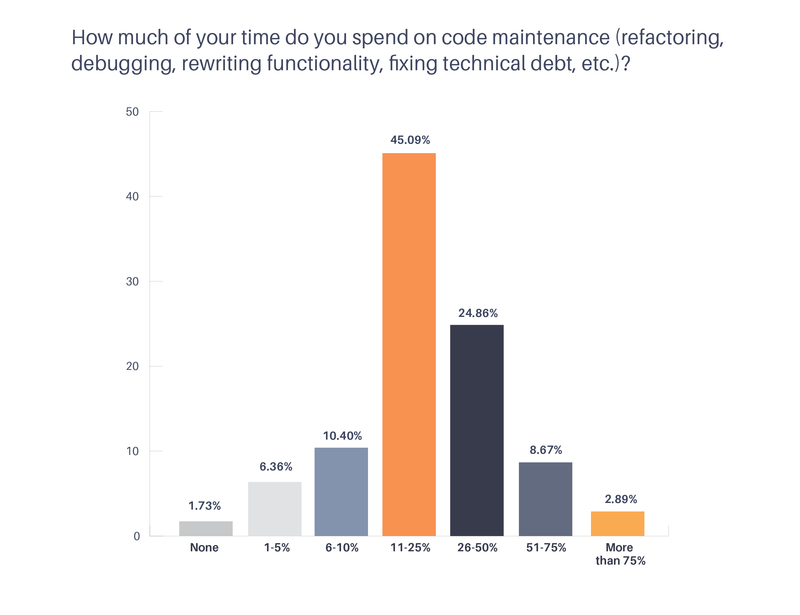 Our data shows that developers spend on average 30% of their time on code maintenance (including tasks like refactoring, debugging, rewriting functionality, paying down technical debt, etc) with open source contributing about 25 percent of this workload. Developers on larger teams spend more time on code maintenance than do developers on smaller teams. And while open source represents a significant minority of code maintenance work for most developers, nearly 10 percent of respondents say most to all of their code maintenance relates to open source. Open source has completely revolutionized the way software is developed today, because it helps developers get work done more quickly and cost-effectively. But as impactful as it has been, there are still opportunities to make it even more useful and less difficult to maintain for professional development teams. Want to learn more about why professional developers use open source, and what would make it even better? [Download the full report with all of the findings from the survey].